This unforgettable aerial journey takes you to the historic site of the World's Highest Cabinet meeting at Kala Patthar plateau, Everest Base Camp, where on 4th December 2009 ministers of Nepal Government held the world's highest cabinet meeting to raise concerns over the melting of the Himalayan Glaciers due to global warming. Nature lovers, holiday makers and extreme adventure enthusiasts can now visit this place at Kalapatthar and have a close view of Mt Everest or hold a corporate meeting. The visit to Kalapatthar (17192 ft / 5242m) shall include two aircrafts - AS 350 B3 Helicopter and Pilatus PC-6 single engine Aircraft. The group size for this package is 10 but the itinerary will be modified accordingly, if the group size is bigger. You begin your aerial journey from Kathmandu airport with one PC-6, single engine Aircraft and B3 Helicopter taking off simultaneously. Moving eastwards, the aircrafts fly parallel to the Himalayan range, allowing magnificent vistas of the soaring Himalayan peaks. After landing at the airstrip in Shyangboche (12,340ft), final preparation will be made. A set of Oxygen system consisting of 4 liter cylinder of Mountaineering Oxygen fitted with regulator and hi-tech Top Out Mask will be provided. 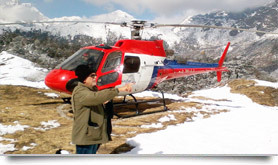 Once equipped, the AS 350 B3 shall make shuttles to Kala Patthar, 4 passengers at a time. After spending around 30 minutes viewing the Mt. Everest or conducting a special meeting, the helicopter will fly you back to Shyangboche. Once we gather at Shyangboche, we shall take the return flight to Kathmandu.